The Lightner Museum offers a presentation on the significance of the art of Edgar Degas, as part of the Museum's special exhibition, "Edgar Degas: The Private Impressionist." The Lightner Museum offers a presentation on the significance of the art of Edgar Degas, as part of the Museum's special exhibition, "Edgar Degas: The Private Impressionist." Lightner Museum educator Alison Schaeffler-Murphy will lead a "Grand Tour" of Degas' life, body of work, and circle of friends on Thursday, April 18, 2019, from 6:00 to 7:30 p.m.
Edgar Degas and his friends were part of the Gilded Age, and among the first travelers who considered a trans-Atlantic crossing a commonplace. This Grand Tour concludes with a look at the artwork Degas created while he was visiting Louisiana in 1873. “Edgar Degas: The Private Impressionist,” a special exhibition that offers a rare look at over 100 original works on paper by Edgar Degas and his circle of friends, will be held at the Lightner Museum from April 12 through June 16, 2019. This exhibit has been assembled from the private collection of curator Robert Flynn Johnson and is touring under the auspices of Landau Traveling Exhibitions with Denenberg Fine Arts. The collection includes more than 50 works by Degas himself, as well as a varied collection of prints, photographs, monotypes, and drawings created by Degas's friends, including works by Mary Cassatt, Alfred Stevens, Paul Cézanne, and Camille Pissarro. A fully illustrated catalog written by Degas scholar and Curator of the Royal Academy of Art Ann Dumas will accompany the exhibit. Admission: Tickets for this Educator's Talk are $5.00 per person (free for Museum members). Visit here for more information and to purchase tickets. 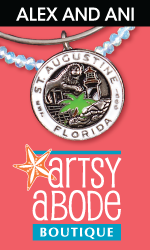 When: Thursday, April 18, 2019, from 6:00 to 7:30 p.m.
Where: The Lightner Museum is located at 75 King Street in the historic district of St. Augustine.